‘TAKE A SEAT’: Rethinking the way we sit at ‘The Danish Museum of Art and Design’ (Kunstindustrimuseet), Copenhagen, Denmark. “The Chair is the piece of furniture that is closest to human beings. You can give it the personal touch.” Hans J. Wegner. The former Frederiks Hospital (built 1752-57) was remodelled by Kaare Klint and turned into a museum in 1907. Today the building houses a large collection of items and appliances that make modern life run with greater ease and efficiency. The museum glorifies the everyday, presenting with pride items essential to the modern kitchen; from a kettle and toaster, to jugs, bowls and cutlery. The pleasure clearly taken by the designers in the construction of such practical objects is surprisingly refreshing. To stop and look at a selection of yellow bowls, decreasing in size, stacked within each other as if they were a Barbara Hepworth sculpture reminds one of the importance and complexity of the simple. The colour scheme of these bowls is whimsical, the selection of smaller yellow bowls surrounded by a larger white bowl stands as a visual reference to a boiled egg. An egg is an appropriate motif for a culinary object, and was also an inspiring shape for Arne Jacobsen, who in 1958 designed his iconic Egg chair for the Radisson SAS hotel, Copenhagen. The placement of such every-day objects, as bowls and chairs, within a museum’s glass cabinets transforms the way one looks at the contents of one’s kitchen cupboards. The museum presents a history of design in Denmark and also in a wider historical context. The influences of other European design movements on the Danes is shown in a collection of rooms dedicated to French Art Nouveau and English Arts and Crafts. Examples of Georges De Feure designs sit between a room commemorating the English designer William Morris’s rich floral fabrics, and a room dedicated to the secessionist Wiener Werkstatle Company designs. Based on the principles of the German Bauhaus school, Danish designers created hyper functional objects with a distinct aesthetic. Borge Mogensen was driven by a vision of how people should live and an egalitarian desire to make pure furniture for the people. Copenhagen is a city within a country with a population of only 5.7million people, a number that does not even begin to scratch the surface of London, and yet the Danes know how to conserve space. Scandinavia is the birthplace of flat pack, from Ikea in Sweden to the Danish Vernier Panton’s innovations with moulded plastics and System 1-2-3. Functionalism and simplicity merged to create a modern minimalist look. Beyond these eclectic rooms which build a history of European interior design and the development of furniture is a shrine to a fundamental element to any modern interior. In European civilisations, the chair has been an object synonymous with power. Elevated to a throne, the chair has been a useful tool in royal regalia, raising the king above his subjects physically. From King Canute of Denmark (995-1035), who set his throne before the sea in an attempt to command the tides, the throne has been an embodiment of the heights of authority. 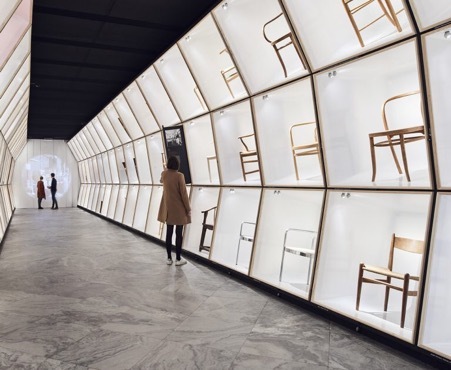 The centrepiece of the museum is its permanent exhibition, The Danish Chair: An International Affair. The exhibition is a chamber of chairs of all shapes and sizes from 1920-1970. From heavy four-legged wood to a light iron spiral with circular red leather seat, the tunnel presents an encyclopaedic monument to the Golden Age of chair design that makes one rethink the way we sit. ‘Danish Modern’ and ‘Scandinavian Design’ grew to global acclaim during the 1960s and Nordic minimalism continues to be appeal to interior designers today. The museum is a shrine to Danish designers, such as Borge Mogensen, and Joseph Hoffmann who took pleasure in the design of objects such as a kettle or toaster, that one might consider mundane. These modernist designers were driven by the desire to create spaces that would reshape the way we live, making furniture to fill the home that was multifunctional, easy and comfortable. The attention to detail and care taken by these Danish designers in the creation of objects, that run the danger of being taken for granted in our post-industrial and mechanised world, is refreshing. One comes away from the Museum of Design with eyes widened to the objects that shape the way we live.